Singapore Work Visa is for all experienced foreign professionals and well-educated PMETs. Singapore Work Visa Suits both foreign staff and company directors. We help the companies and individuals in accessing the eligibility for work visa and accordingly follow the rules and regulations for the required paper work in order to process the work visa. Valid Job offer in Singapore. Work as manager, executive or specialized job. Minimum fixed monthly salary of $3,600. Acceptable qualifications, usually a good university degree, professional qualifications or specialist skills. The China Academic Degrees and Graduate Education Information. Employers have to advertise job vacancies on government jobs bank portal for at least 14 days before they apply to hire an Employment Pass (EP) holder from 1st August 2014. Free service provided to all Singapore-registered companies and local job seekers. However, only registered authorized user can access. Who can sponsor Employment Pass? Only established Singapore company whose strong financial to pay this foreign employee’s salary. Company who genuinely made an attempt to hire local posting the relevant job posting in government public job site JOBS BANK be advertised for at least 2 weeks to ensure that the Singaporeans are given a chance to be considered for this job before the employer prefers a foreign talent. Application processed based on Ministry of Manpower’s (MOM) guidelines, documents filed meets the criteria. Expert Immigration Consultants analysis each applicant’s documents. Follow best practices in filing documents to maximize the chances of favorable outcome. Adhere stringent visa application filing procedures. Customized solutions to individual customer’s needs. Every application has professional attention with the updated immigration and ministry of manpower policies. * Consultation & Employment Pass Application Assessment. * Document Verification & Filing of Employment Pass Application. * Tracking Employment Pass Application & In-Principal Approval Notification. * Issuance & MOM Appointment booking. 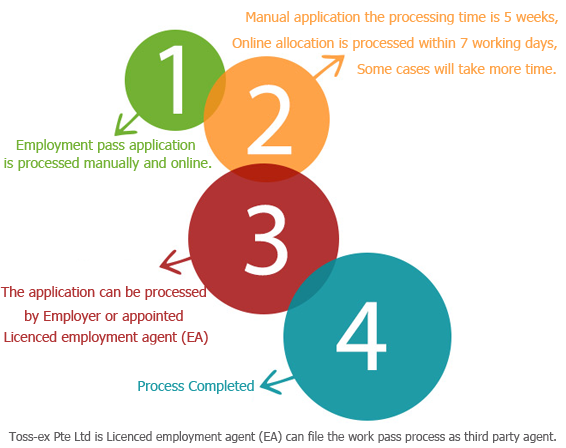 It is an in-house process that assesses to verify the required documentation to qualify for an Employment or S Pass based on the information you provide. These include Passport, birth certificate, marriage certificate, Education Certificates, mark sheets, salary, designation, work experience and relevant experience. It does not guarantee but gives you peace of mind your application given at-most care and attention by the attended professional. We file only the application is 100 % meet the requirement for approval. No compromise on quality. Application processed through stringent methodology to analyse both company and applicant’s eligibility verified by Self-Assessment, Tool (SAT) before we process.